Sun, sand, beach, and the best thing of all, NO SCHOOL! Those are just a few of the things that people are very much excited when it comes to the summer season. Though it is still debatable which of the four seasons people are most excited about, winter or summer. Nevertheless, summer is where most of the fun happens, and it is also the best time for traveling and going out on road trips. And when it comes to traveling, there will most likely be souvenir shopping. But then, looking for souvenirs is not an easy task. Looking for things that the other person may like is quite complicated. Who knows that the person receiving the souvenir may not appreciate what you got for them? The safest souvenir that you can probably get for someone is also the easiest to find and the most affordable, these are called postcards. If you are plan on making your own postcards, however, we have a collection of summer postcard designs below that you can download. Go ahead, check out the designs now. Make the reader know that you are thinking about them even while on a vacation. Let them know that you wish they were there with you. 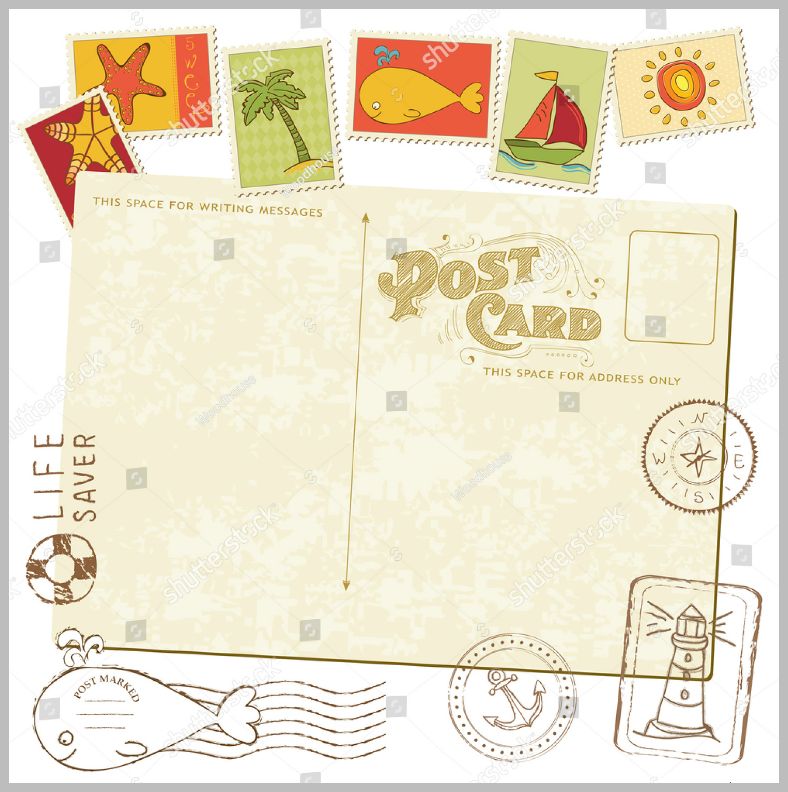 With this vintage postcard design, you will definitely be able to convey that message to them. 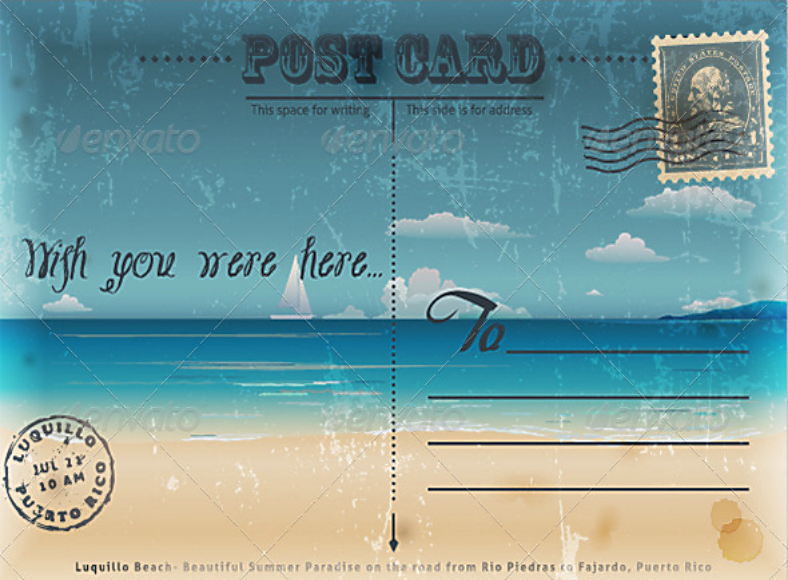 Above is a rustic yet simple summer postcard design that you may also be interested in. This design features a divided back, with two columns intended for the message and the addresses of the sender and recipient. Send a message to people, let them know what summer really is, that it is not merely a season but actually a state of mind. Download this multipurpose postcard design and have it printed on the front page of your postcard to share that realization to your recipient. A postcard is a piece of thick paper—usually a card stock or a high quality paper that is rectangular in size—which is used for writing messages. While it may sound the same as regular letters, one of the differences with postcards is that it contains two sides: the front side of the card usually bears an image or an illustration, and the back is usually blank or has rows of horizontal lines intended for writing the message. Another difference with postcards is that it can be mailed without having to use an envelope. Before postcards ever existed, there was the lithograph prints—small cards that were cut from wood. These were considered to be the direct predecessor to the “mailed” postcards, and these lasted lasted until around 1861 when a person by the name of John P. Charlton first sent a card by mail. However, the copyright to his postcards was transferred to H.L. Lipman which was then labeled as “Lipman’s Postal Card,” and these lasted in the market until 1873 when the first government postcards were being produced. In 1889, the Heligoland card was printed and is considered to be the first to feature multiple colors. And it is also during this year and in 1890 that the rise in popularity of postcards began, and it resulted from the cards that contained the images of the Eiffel Tower. However, during these years, postcards were entirely used for sending messages or for advertising, and it was only in 1893 that the first batch of souvenir postcards were ever invented. By the 1900s, the first “real photo” postcards were printed, and these contained actual still photographs that were printed on the film stock paper as opposed to the illustrated or painted ones from its previous incarnations. Another big change was also made during this time, and it is the use of the front side primarily for the photo or illustrations and the back side for the messages. Millions of postcards were sold and delivered during these years that it has been referred to as the “Golden Age” of postcards. Beginning in 1939, the new type of postcards were invented, and these were noted for its use of vibrant colors and bright images, these postcards were referred to as “Photochrome Postcards.” Even though the production and the use of postcards slowed down during the World War II because of the shortage in supplies, the photochrome postcards were able to help in its rising back from the ashes after the war, and it even dominated the postcard market. These photochrome postcards are the closest things to actual photographs, and these are still being used up to this day. What Are the Types of Postcards for Businesses? Regular Postcards. The most popular type of postcards is the regular sized postcards, which has a dimension of 4.25 inches by 5.6 inches. This type of postcards is not only efficient but also affordable, which is the main reason why it is the most commonly used type. Also, regular postcards allow the business to go minimalistic and to focus more on the call-to-action. Jumbo Postcards. If you wish to convey a lot of information and the space provided on the regular-sized postcards is insufficient, you can always choose to use jumbo postcards. This type of postcard is slightly bigger than the regular-sized type with a dimension of 5.5 inches by 8.5 inches, and this is usually used by businesses to maximize their results; they may even be able to incorporate complex graphics and various contact details with all the space provided. Block Postcards. These postcards are sized at 6.125 inches by 8.25 inches, which is a step up from the jumbo postcards, and allows businesses to include more than just one image. With block postcards, the space is big enough for two or even three large photographs, a business logo, some contact details, and even a personal photo of a representative from the business. Panoramic Postcards. From the name itself, we can already associate it with images that are horizontally long, which is entirely the case for this type of postcard. Panoramic postcards have a dimension of 5.75 inches by 11.25 inches, which is very wide and spacious enough to allow businesses to get as creative as they want. They can either choose to use a single photo to cover the entire space as with panoramic photos, or they can also make a wide collage of photos. However, it is still advised to keep the design simple to avoid cramming up the space provided with unnecessary elements. Giant Postcards. Being the last one on this list of postcard types, you know this one is, by far, the biggest of them all. At 8.5 inches by 11 inches, these postcards are indeed gigantic and will allow businesses to further maximize results by adding either multiple photos or details about their listings. And since the space provided is more than just enough, they may be able to add specifications to support the information that were listed down. Above is an artistic, colorful, and vintage-inspired summer postcard design that is sure to capture people’s attention. 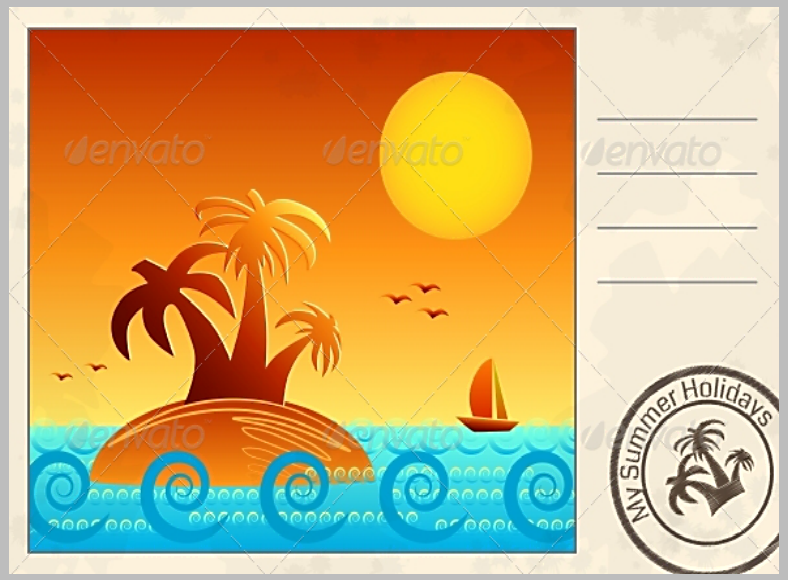 The design shows a small island in the middle of the ocean with a pair of coconut trees and a beach umbrella over it. On the top and bottom part of the design are images of blank ribbons that you can use to write brief notes or phrases for your recipient. The great thing about this design is that it is very versatile that it can also be used to make a summer-themed flyer, because why not? 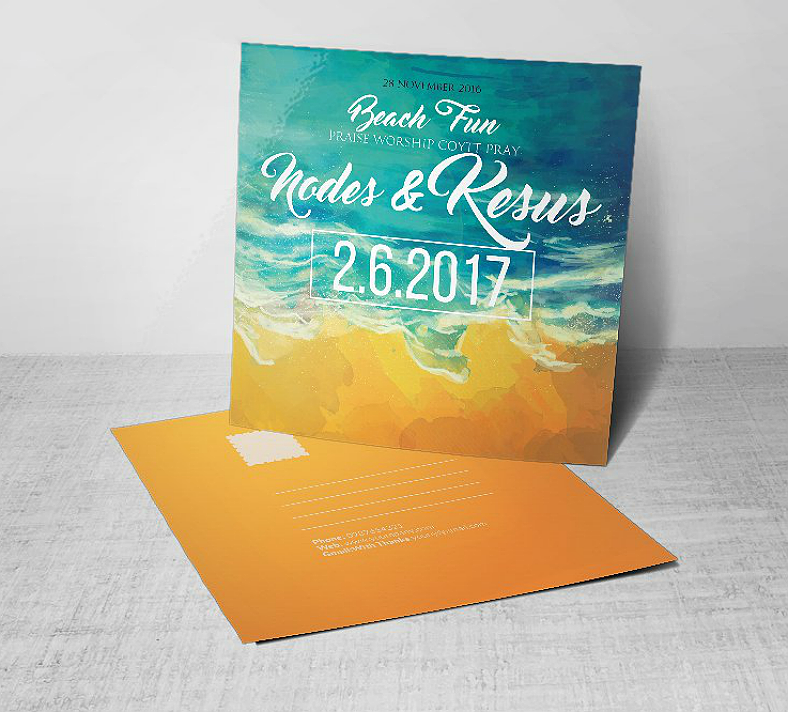 Summer is indeed the home of many beach parties, and if you are organizing one, you may want to advertise it through postcards. If you do, then you may find the postcard design above very useful, it will not only serve its purpose of informing people regarding the party that you are planning, but the design itself it so beautiful that it is worth treasuring. People—most especially kids—enjoy going to the beach regardless of the season (except winter, of course). They get to do various activities aside from swimming that includes playing volleyball using a beach ball, parasailing, or making sand castles. 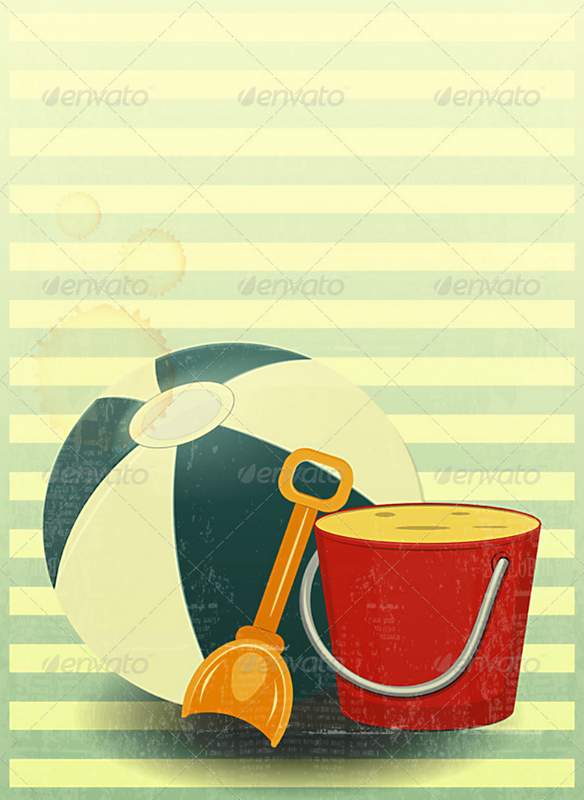 The design above shows illustrations of a beach ball, a toy shovel, and a bucket, which are just some of the tools that you can use when going to the beach. Also, what’s great about this postcard design is its vintage theme, which adds to the quality of this summer postcard design. 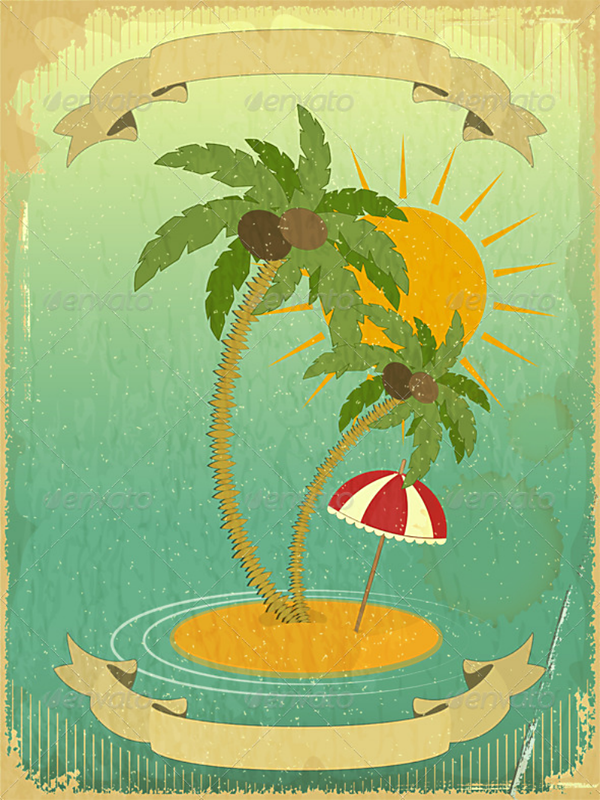 A surfboard, a pair of swimwear, fruits, an ice cream cone, a pair of flip flops, a beach umbrella, this summer postcard design has got almost everything that you can find at the beach. 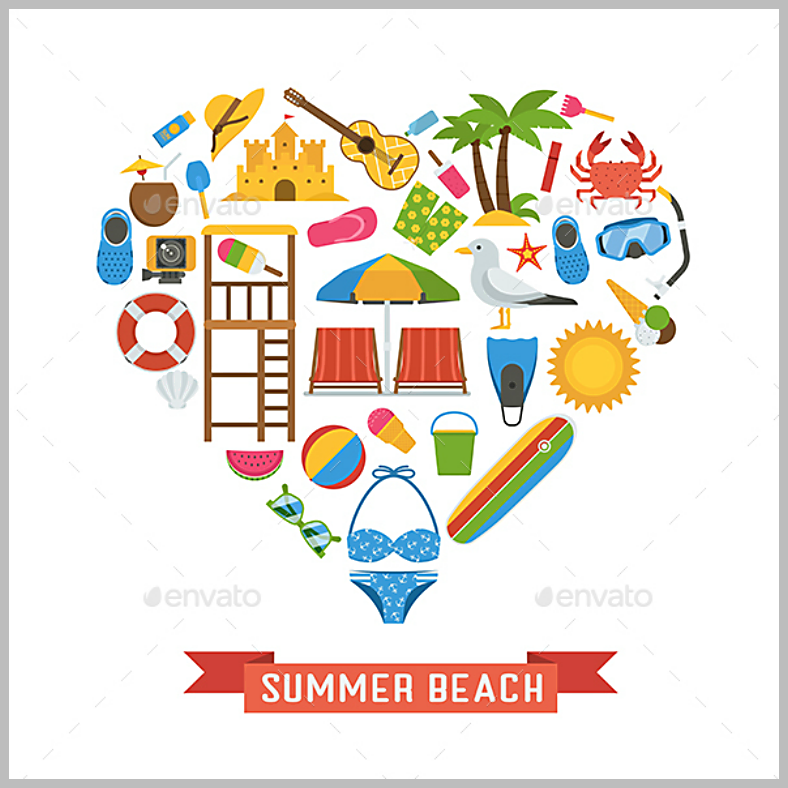 And to make it even more symbolic, these elements are arranged in a way that it forms a heart, which only shows how much people love summer and the beach. Why Is it Advised to Send Postcards When Traveling? We did mention earlier that it was in 1893 that postcards were first used for souvenir purposes, and that purpose is still evident up to this day. One good reason for sending postcards when traveling is because they are considered to be one of the best souvenirs in the world, and postcards truly hold a lot of sentimental value. Opening the mail is always exciting. I mean, who doesn’t enjoy receiving something in the mail? Opening the mail and finding something that has been address to you is somewhat special that it could hardly be explained even further. If that’s special enough, then how much more when you see that it is actually a postcard sent all the way from a different part of the world? Now, that is special. Aside from being special or the best souvenir that you can give to someone, postcards are also inexpensive and can be found almost anywhere from bookstores to 24-7 convenient stores. That said, if ever you’re traveling and you can’t decide on what to get for someone, why not postcards? Many would say that those that are hard to find are more valuable, that’s not entirely the case. The value of postcards lies more on the message written by the sender rather than the pre-printed image on the front. Though we did mention that postcards are available almost anywhere and can be bought for a very low price, you can always make your own postcard designs for a more personal touch. If you think that designing postcards may be time-consuming or stressful, it’s actually not since you can always download designs templates from the Internet and simply make alterations to the design. If you’re planning on designing your own postcards, below are a few tips that you may want to consider. Always keep the design simple and easy on the eyes. Nobody would want to keep or even look at a postcard that looks like it was picked up from the trash bin. Just keep the design as simple and relevant as possible. People love color, so be sure to make the colors of the elements on your postcard as vibrant as possible. But then again, make sure that the elements are high in quality and are capable of being bright and vibrant because they might look ugly if you increase the saturation and brightness level beyond its limitations. Embrace the white space as much as possible. In fact, you may even be allowed to exaggerate the amount of white space on a postcard design. If you’re wondering why, white spaces are actually able to create divisions in between elements and make them distinguishable from other elements. 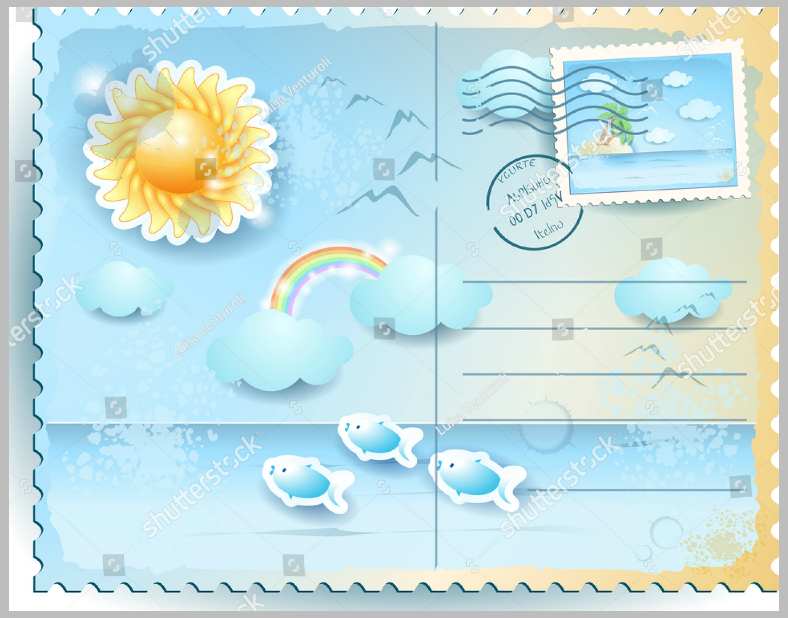 This way, it will help in making the look of the postcard organized and clean. Always print in the highest quality possible. If you choose to print it yourself, always invest in a high quality printer and ink toners, and set the printing quality to its maximum. However, you can always choose to have your postcards printed in printing presses or companies to make your job easier. The summer season is every kid’s favorite time of the year, and it is because it gives them the break they need away from school. But just because there aren’t any classes or homework, it doesn’t mean that they can stagnate themselves and be lazy. There are summer activities that they can get involved in, and one of which are summer camps. 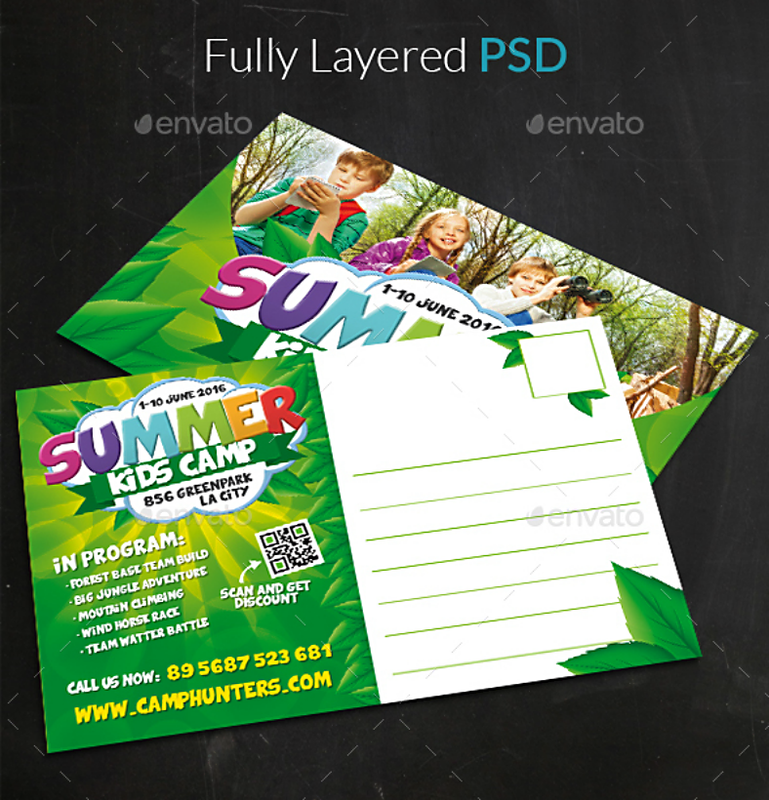 The postcard design above is meant to advertise summer camps and to promote them so that people would come to realize that these are actually beneficial for children. 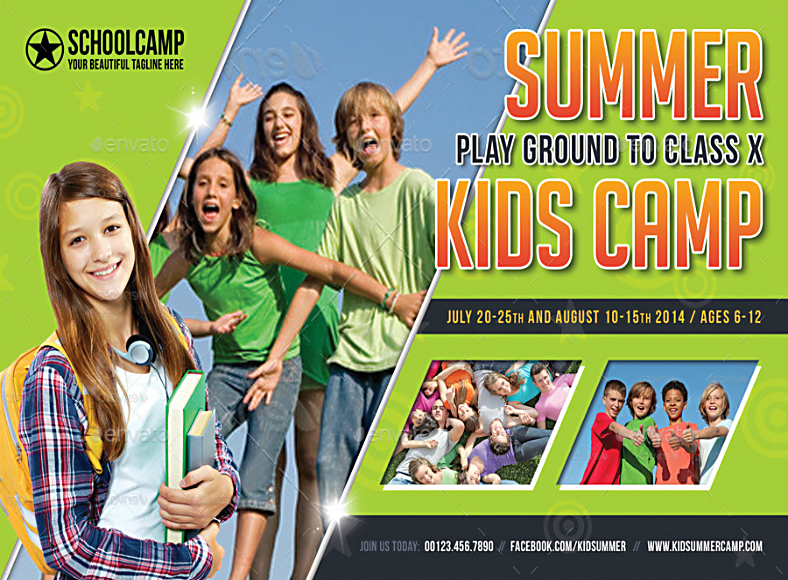 But if advertising through postcards isn’t your thing, you can always do it through summer camp flyers. Above is a simplistic summer postcard design, with the front side showing an image of a woman wearing a striped swimsuit and sipping on a drink. The back side of this postcard design is divided, with the left half meant for the sender’s message and the right half intended for writing the addresses of both the sender and the receiver. Now what did we tell you about summer camps for children and teens? They are indeed important and beneficial to keep kids from being lazy during the summer. With summer camps, they are able to interact with other children and even make new friends, they may also be able to expose themselves to new activities and maybe even learn new skills. But the most important benefit that they can get from joining summer camps is that they can have a lot of fun. Again, you can always promote summer camps through postcards, but for a wider audience, summer camp flyers may be a better option. What Are the Best Ways to Enjoy Summer? If you enjoy swimming, you don’t have to go to an expensive beach or resort for that purpose, I’m sure there are a lot of good and inexpensive beaches nearby that you can go to. As a matter of fact, anywhere with clean water is good enough. What’s important is that you’ll be able to enjoy the trip. And do you know how to make it even more enjoyable? Let your family or friends tag along. However, if you’re not a fan of swimming, you can always go camping or hiking somewhere, though the former is far easier to do since you can always set up a camping site in your very own backyard. Hiking, on the other hand, allows you to dive straight into nature and let you appreciate the beauty of the wilderness. But then again, if you are not into either of those two, why not spend time at a local park. This way, you won’t need to travel far from the convenience of your own home and you won’t need to worry about anything. There is actually a lot that you can do at the park; you can always feed the birds, smell the flowers, or appreciate the view all around you. Lastly, if all of those are really not for you, then go to the library, though this is something that you can do regardless of the season. Since the library is indoors, you won’t need to worry about getting a sunburn. There are a lot of very good books inside the library, and it is up for you to explore and find them. 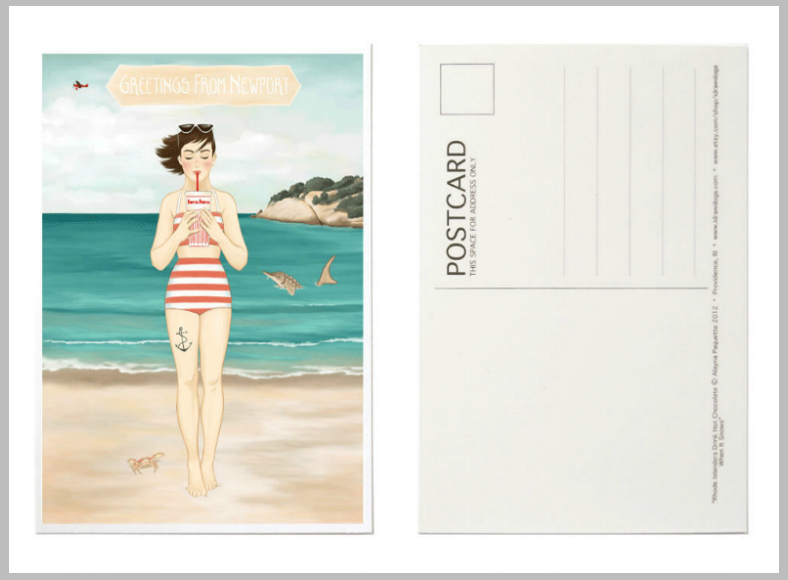 Lastly, above is a modern postcard design that is so adorable it’s too hard to even try and resist downloading it. 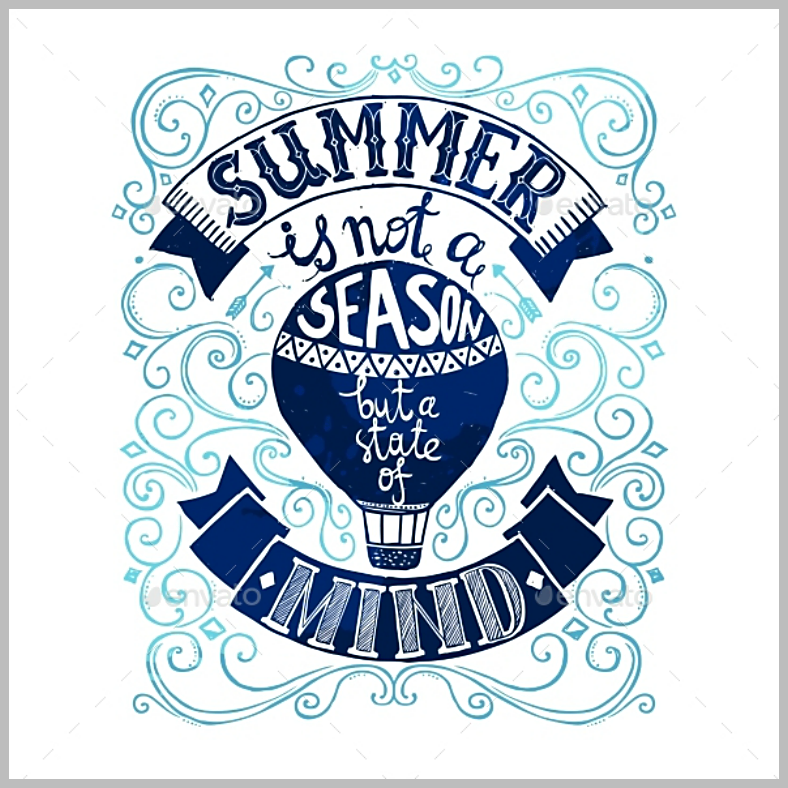 As you can see from the image above, the front side of the design shows an abstract illustration of summer-themed elements, and over it is the typography indicating the greeting for the season. The back side, on the other hand, is divided to two columns and has an illustrated background to enhance the appearance of the design. Did you like our collection of summer postcard designs? We hope you did since these postcard designs were actually collected from among the best ones found on the Internet. These were gathered from multiple sources that offer other kinds of designs aside from just postcards. With regards to who made them, these postcard designs were created by professional graphic artists from all over the world, those who know how to capture people’s attentions with their creativity. As for the price, you will definitely be glad to hear that every single one of these postcard designs were priced reasonably, which means that you won’t need to spend a lot just to get your hands on them. 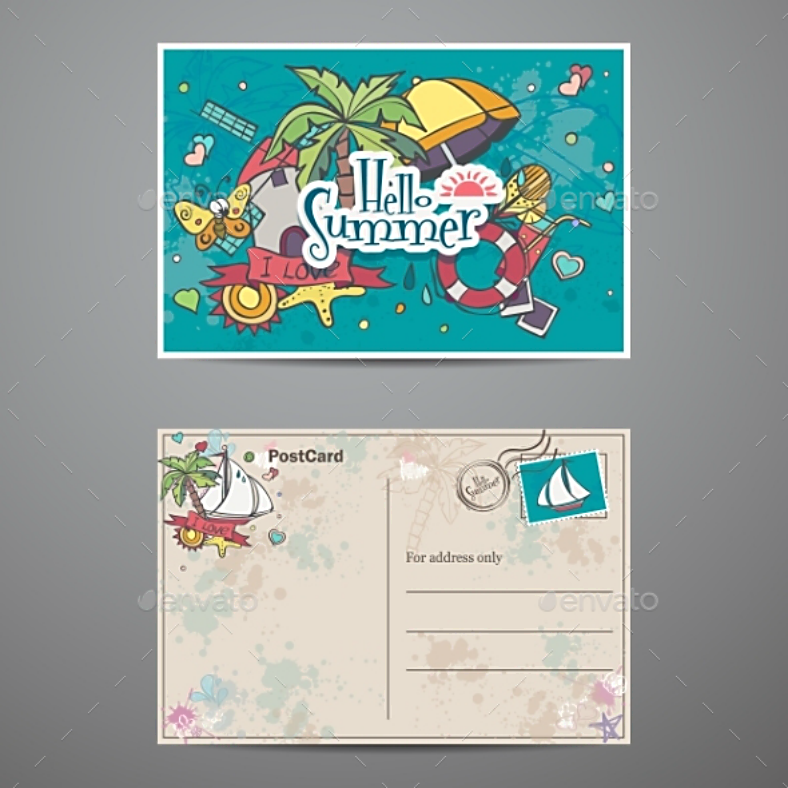 But that’s not all, these summer postcard designs are also fully editable, which means that you are allowed to make as much modifications as you want on these designs without ruining its sharpness. Did all of that sound good to you? If so, download your own postcard design now, or you may also check out our other collection of even more vintage postcard designs.